Back in the day, if you wanted to get away for a break with extended friends or family, your first port of call would probably have been a hotel. All well and good. But you’d all be dispersed in different rooms, you’d pay through the nose for each room separately and you’d also be sharing your precious holiday time with a bunch of strangers. Then, in 1992, came a low-budget British movie that changed all that. Peter’s Friends, starring Stephen Fry and Hugh Laurie, focused on a group of former university friends who get together for a New Year’s Eve weekend reunion at a large English country manor. They reminisce about the good times now long gone, eat and drink a lot and share some guilty secrets. A light went on with the British public. Here was a chance for a college reunion, a hen or stag weekend, or a multi-generation family break. Everyone would share the bills, chip in for the food and drink, and they could all stay somewhere lovely in privacy. Since then, of course, the concept of renting large holiday homes in Cornwall, Devon or the Cotswolds has taken off in a big way. Today’s rentals come with bells and whistles that Peter and his friends could only dream about. But wait, you say… the great thing about hotels is you don’t need to cook. Rent a large holiday home and somebody ends up tied to the Aga. Not necessarily. Why not enlist one of our catering partners such as Dine Indulge? With platters from just £24.99 per head and deluxe tasting menus at £69.99, Dine Indulge offers something for everyone. Put your feet up with a Prosecco while expert chefs prepare your gazpacho shot tickler or truffle tagliatelle. They’ll even wash up afterwards. Of course, one of the great aspects about renting self-catering holiday homes is that they’re multi-generational. You can invite along everyone from new-borns to great-great grannies and they can all rub along nicely, get together for meals and evening socials, or do their own thing. Many large UK holiday homes have been designed with all this in mind. Typically, they’ll offer an open-plan arrangement, often with kitchen, dining area and living room happily adjacent, with no conversation-killing walls to spoil the mood. You can chit and chat as you chop and stir. Should you want to escape with a book or a spot of Spotify, you’ll often find second living areas or snugs or, if you’re really lucky, a swanky balcony or roof terrace, specifically for that purpose. Large, self-catering holiday homes also come purpose-designed for different groups. Hen or stag do? You’ll want a fabulous, funky party pad. Maybe you could consider Yorkshire’s Northridge Hall. This is stag heaven, with 9 bedrooms and 2 hot tubs. Plenty of garden space and Sky TV tops it off. For beachy types, Edge 14 is a cool, contemporary classic on the Cornish coast. It’s wired for fun, with 42-inch 3D TV, surround-sound audio, full Sky TV, wireless broadband and Netflix. There’s a magnificent outdoor area with hot tub and terrace, and you’re just minutes from the beach and the chance to surf, kite-surf, jet-ski, scuba-dive or zip-wire your way to stag nirvana. For hens, renting gorgeous party houses such as Keepers near Blackpool or Warwickshire’s Elephant & Castle offers the chance to sign up for cocktail-mixing lessons or to rent a ‘butler in the buff’, a young man wearing just an apron and a smile who’ll happily serve up canapés and drinks while offering a decent dose of eye candy. Of course, we’re not all after a final fling before committing ourselves to marital bliss. You might be wanting to channel your inner Fry and Laurie and meet up with those old uni friends or just get the whole family together for once. If so, a grand country manor will do the job nicely. 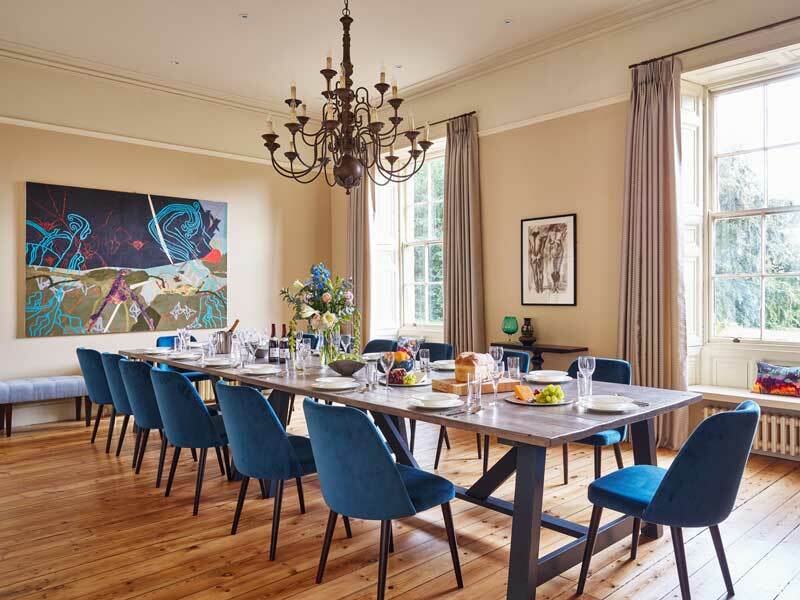 Consider Kingscote House in the Cotswolds, dripping with Regency charm and family warmth. There’s a snug for snuggling up in front of a movie, a jam-packed music room with jukebox, squishy sofas for good books and even Japanese Gardens for that tranquil escape. Then there’s Lakeland’s The Fitz, complete with landscaped grounds, hot tub, play barn for the kids and barbecue lodge on its own elevated deck. Great facilities, but there are houses out there with toys and games that trump them. Many have heated outdoor pools, such as Marsden Manor in the Cotswolds, with the bonus of a game of tennis. There’s a helipad at Lamper Head and a hammam at Dart Valley House. Hired help in your luxury holiday home isn’t restricted to the catering. You can get all kinds of action going on-site. You won’t be able to organise much zorbing in your average hotel, but rent a luxury country house and that’s just one exciting option open to you. How about a murder-mystery night? Getting pampered with a pedicure, manicure or hot-stone treatment? Chocolate parties? Body sphering? Archery? A casino evening? These are the joys of renting your own private hotel. Your own space. Your own itinerary. Your own choice of guests. Hot tubs, hammams and helipads. Choose from country or coast, party pad or family seat. Celebrate a 21st, a 40th, a wedding anniversary. Get the caterers in, pop some corks and get the party started. Your search for the perfect luxury holiday home begins here.